Pasee en bicicleta por la ciudad de Ho Chi Minh en un tour en bicicleta de un día completo que explora los vibrantes vecindarios de la ciudad y los lugares de interés locales. Hará una pausa para visitar sitios históricos como el Museo de los Remanentes de Guerra y el Palacio de la Reunificación, con descansos para degustar café vietnamita, pho y cerveza local. Explorar la ciudad de Ho Chi Minh en bicicleta es una excelente forma de empaparse del ambiente único, desde el bullicioso barrio chino hasta el antiguo barrio francés y las orillas del río Saigón. Vea algunos de los principales atractivos de la ciudad. Aprende sobre la historia de la guerra en el War Remnants Museum. Prueba el café y la cerveza de estilo local. Incluye todas las entradas y el equipamiento necesario. Recogida y regreso en los hoteles de la ciudad de Ho Chi Minh. The tour is really half a day and involves a taxi (included) back to the hotel at the end. It's not a bad way to see Saigon outside of the main sites and we enjoyed seeing some of the markets.The bikes were in average condition with some issues that would have been dealt with if serviced properly. The guide Thung was friendly and cycled safely. However, anyone not comfortable cycling in the city should give this a miss as a lot of the cycling is on the the main roads and junctions. If you have a bit of extra time this isn't a bad way to spend half a day. Im at a loss to explain the positive reviews for this tour other than guessing that this operator farmed out our tour to another company. First off, our guide was on time but the bikes arrived almost half an hour late as we stood outside in the sun, and it went downhill from there. The bikes were in terrible condition and the helmets were gross, with the straps totally stained with sweat and who-knows-what else. The website promised an all-day tour beginning early, and we rode off over an hour late and ended at 2:30. The guides English was not up to snuff, not that it mattered, as he had almost nothing to say at any of our stops. The first one was the Post Office, which supposedly has historical and architectural significance, but well never know, as he said nothing and didnt even accompany us in. We bought our own coffee before the War Museum, even though the tour description says its included. I went to the info desk inside to inquire if they had organized tours and they provided a very knowledgeable and interesting docent who gave us a private tour the highlight of our day. Then we had a mediocre lunch sitting next to the kitchen which was hot and steamy. We had one other stop at a Buddhist temple, then a really long and unsightly ride back to their office, which was actually a house where the guide lived. Note that we didnt stop at other promised sites. Then, get this, they order a Grab Vietnamese Uber to take the four of us back to our apartment, which was OK until he told my three adult-sized teenagers to squash in so he could be the fourth in the tiny backseat and ride with us to reclaim his motorbike. Talk about unsafe and uncomfortable. How cheap can you get? A word of warning: the roads in Saigon are crazy, with tons of motorbikes going all directions at all times and you will be uncomfortable in the traffic. This tour is not for the faint of heart. And we have been on many bike tours, and this one was far and away the worst. At one point, my sons bike chain came off no surprise given how junky they were. He was the last rider, and I noticed him not behind us after about one minute, but by then, the guide was way far ahead and he didnt stop until half a mile later when he finally turned around to see we werent with him. 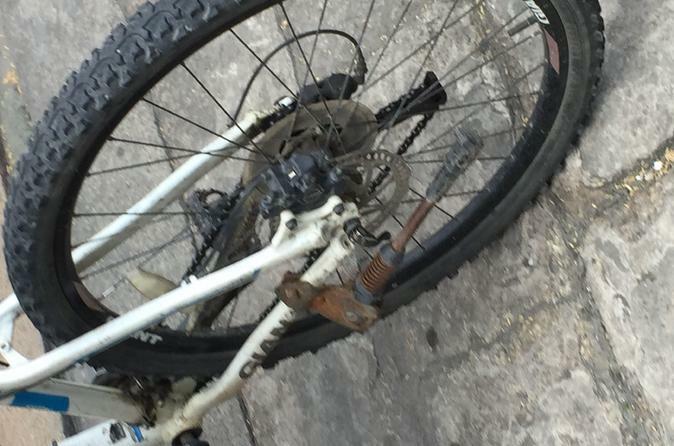 To his credit, after the second time the chain came off, he switched bikes with my son so that problem ceased. Bottom line: Saigon is the wrong city for a bike tour, but if youre gonna do one, find another company. Enjoyed the tour. Be advised that a lot of the tour is on the main streets of Ho Chi Minh city. TripAdvisor can be a bit confusing as they label motorcycle tours as bike tours. This is a cycling tour and well worth it. I was scheduled for an REI cycling tour from DaLat to Hanoi and meeting my group the same day. I had already done a couple of motorcycling tours but was itching to be more active and get on a bicycle. I ride in San Francisco and have ridden in Bangkok. This was great as it got one used to riding in traffic and realizing that nothing was going to happen and one is responsible for what is in front of them. Having a local who had a sense of your abilities was fantastic. We visited the waterfront, Ho Chi Minh Plaza by City Hall, Post Office, War Remnants Museum, Birdsinging Park, a Temple in Chinatown, a Market street in Chinatown and then some. Tong Le was pretty flexible and would have adapted the tour to my needs, in fact had to cut it short some as I had to check out of my hotel room at 1 PM. We even went for a longer ride out to his office in the suburbs. Initially I wasn't that hungry, and living in the Bay Area with a large South Vietnamese community, having had my share of Pho, wasn't that keen but I'm sure glad I went. It was delicious, some of the best I have had, I see why Tong picked this place. On my REI ride, it was clear that I was ahead of the group when it came to navigating traffic and traffic circles, this ride gave me a lot of confidence and thus could enjoy it much more. I knew what to expect though nothing compared to the traffic in Saigon. Had I not had a cycling trip already booked, I would have certainly booked a Mekong Delta ride with Le. I will post some images but my GoPro videos would do it more justice. Of note, Tong has guided REI trips in the distant past. From what I experienced all people with all types of cycling experience could do this easily-don't hesitate. What a great day! Tung - our guide - was fantastic! We cycled all through the city with stops at the major attractions. Tung had lots of info at each stop and also recommended places to go back to or restaurants to try. Our pho lunch was a trip highlight and we went back for pho a couple more times during our stay. Tung! Greatest bike guide for Saigon/Ho Chi Minh City! Not too scary and fantastic way to see the City. Highly enjoyable, recommend this activity. Had a great bike tour with Tong. We meandered down many streets passing through several markets, Saigon river, Presidential Palace, Saigon Square, Cathedral, Post Office, Vietnam War Museum, Chinatown and ending at his bike shop. Stopping at each destination for a quick history lesson and pics, with a stop for coffee. Last destination was a great small Pho restaurant for some noodle soup and cold beer. The bike ride was great. A bit intimidating at first, biking alongside thousands of motorbikes, but you get the hang of it. I do recommend having some previous biking experience - being able to control motion and speed well under crowded and sometimes unpredictable situations. But the craziness adds to the excitement. All in all, a great way to get some exercise and explore the city. I booked this half day tour of Saigon from my hotel and found myself the only one on it! It was great. My guide, Tung, was an engaging young guy who turned up at my hotel with a well-maintained bike for me complete with helmet. And, after introductions and a short briefing, off we went into the Ho Chi Minh City traffic. I'm confident on a bike so I wasn't too apprehensive about the high density traffic on the city streets and Tung was also very careful about my well-being. Crossing lanes, weaving in and out of the army of motor scooters and cars was no problem. We visited many of the sights Saigon is known for, stopped at a local cafe for, as Tung put it, The best coffee in Saigon, stopped at at Tung's favourite traditional Vietnamese eatery for Pho and beer - it was superb - and generally enjoyed the pedaling around the city, being part of the constant cacophony and tangle of buzzing mopeds, horns, and other vehicles. Cycling in the heat was surprisingly bearable as the slight breeze from our progress cooled things just enough to make things comfortable. Tung was good company, careful of safety, spoke good English and was worth every dong. I also had the unexpected bonus of finishing up at his house and meeting his wife. The end to a great half day in Ho Chi Minh City. Thanks Tung! What a great introduction to the city. Ken was fantastic and did a great job of keeping me safe in the insane traffic. Great to have the chance to speak to someone local and learn a bit more about the culture. You need to be reasonably proficient on a bike and ride with measured confidence. Great to be right amongst all the scooters.